Chefs tend to need to have a lot of energy to thrive in the stress of a professional kitchen. You have to deal with on the job stress, chronically unsociable hours, no such thing as a weekends and Christmas and Birthdays can be a washout most years. Chefs have to wind down from the stressful environment of the kitchen, in order to be able to do it again the next day. Performing at a high-intensity level can be both motivating and stressful at the same time. Chef Alan says that success is measured on the ability of being able to perform at a high-level day in and day out. 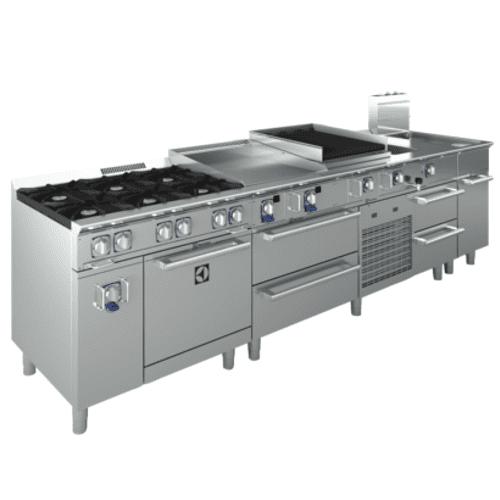 Using the right equipment to alleviate stress, increase quality and facilitate the workflow process is integral to the success of a Chef. The perfect Electrolux “team” is the EMPower modular range system, pairing any combination of equipment to maximize space and efficiency. Chefs can spend more time creating new menu items to address the constantly evolving food and taste trends, while allowing the right equipment to work the way it was designed to.